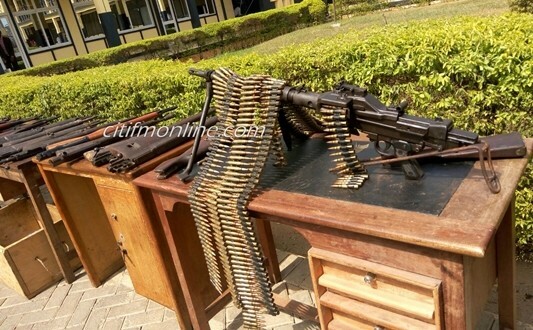 Police in the Ghanaian city of Kumasi last month arrested a 72-year-old suspected arms dealer from Burkina Faso and five Ghanaian accomplices in an operation that recovered a sizeable cache of small arms and ammunition. The seizure included 11 AK type and 10 G3 type self-loading rifles; 45 self-loading handguns of undefined make and model; 1 French AA-52 general-purpose machine gun; and significant quantities of 7.62 × 54R mm, 7.5 × 54 mm, 7.62 × 51 mm, and 7.62 × 39 mm ammunition, as well as a few rounds of 12.7 × 108, 12 ga shotgun shells, and firearms components, including four firing pins. Further analysis of available images suggests that a number of bolt-action rifles were also captured, including a number of French MAS Mle. 1936 models. Briefing media on the arrest, Ghanaian police commander for the Ashanti region, Commissioner Nathan Kofi Boakye, said that the arrest of Moro Sata and five unnamed Ghanaian citizens in the Akwatia Line district of Kumasi, has crippled a regional small arms smuggling syndicate which sourced weapons from various West African countries and sold them to conflict-prone parts of Central, West and North-West Africa. 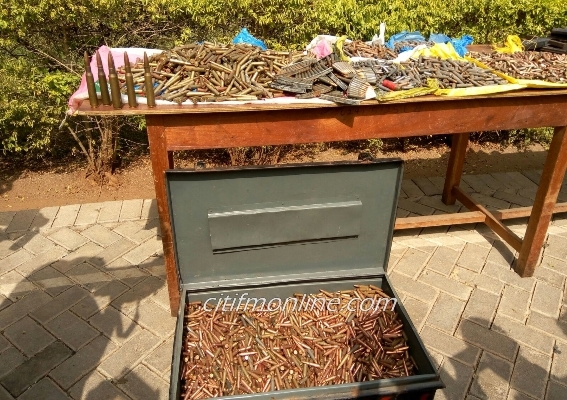 Boakye said police have been seeking the arms dealer since October last year when a large quantity of ammunition illicitly trafficked from Côte d’Ivoire was found on a street in Kumasi, perhaps accidentally mis-delivered. According to reports, Moro has already told detectives that the network used Ghana as transit point and for the storage of weapons sourced from one Abdul Kadri Aria, an arms dealer from the Côte d’Ivoire. He told police that the syndicate sources its weapons from Niger, Burkina Faso, and Côte d’Ivoire and sells to undisclosed individuals and non-state actors throughout the region. The AA-52 GPMG and MAS Mle. 1936 rifles are especially common within Côte d’Ivoire. ARES’ conflict materiel (CONMAT) database contains numerous examples of both of these small arms in illicit circulation within the region, often originating in Côte d’Ivoire. Mauritania, and the Central Africa Republic (CAR). Pirates and other criminal elements operate throughout the Gulf of Guinea, an area which stretches from the coast of Ghana in the south to the Bight of Benin in the north-west. Arms traffickers also stand to realise profits from supplying arms and ammunition to the low-level intercommunal feuds which regularly erupt over grazing lands and water rights among pastoral and sedentary communities in all five countries of the Sahel region. In West Africa proper, the threat of armed cattle raiding and the increasing demand for weapons for self-defence have fostered the growth of arms markets in Ghana and Nigeria.